The Graduate Certificate Program in Quilt Studies is offered by the Department of Textiles, Merchandising and Fashion Design. 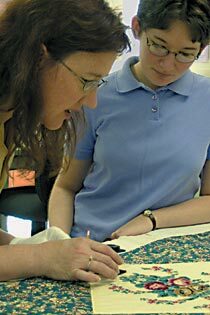 It allows graduate and post-baccalaureate students to gain scholarly credentials in Quilt Studies. The Quilt Studies Certificate strengthens credentials of curators, collection managers, appraisers, collectors and educators. The University of Nebraska-Lincoln is an international leader in the field of quilt studies with its renowned International Quilt Study Center and Museum and its comprehensive collection of quilts spanning five centuries and representing quiltmaking traditions around the world. The Quilt Studies faculty, all members of the Department of Textiles, Merchandising and Fashion Design, are recognized leaders in the field. They teach, conduct research and engage in creative activity, and they participate in a variety of quilt-related research and educational initiatives around the world. The Graduate Certificate in Quilt Studies is open to graduate students currently enrolled in graduate degree programs at UNL, and is also available as a standalone (non-degree) post-baccalaureate certification. Rolling admission; contact department for more information. For additional details check out the dept./program website: Quilt Studies.